We start today with 10 fruit filled pancake recipes from food bloggers across Canada. Get out the syrup and grab a fork! [Banana Pancakes](http://bakeeatrepeat.ca/banana-pancakes-recipe/) from Bake Eat Repeat. [Strawberry Pancakes](https://myegglessworld.com/2016/01/28/strawberry-pancakes/) from **My Eggless World**. [Apple Pie Pancakes](http://www.simplystacie.net/2016/01/apple-pie-pancakes/) from **Simply Stacie**. 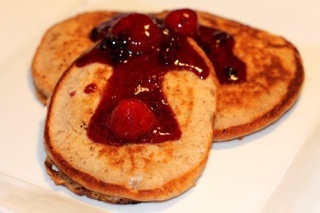 [Fresh Berry Pancakes](http://thedoitallmama.com/2015/06/recipe-fresh-berry-pancakes.html) from **The Do It All Mama**. [Vegan Lemon Buttermilk Pancakes with Blueberry Sauce](http://kokoskitchen.com/breakfast/drop-dead-recipes-vegan-lemon-buttermilk-pancakes-with-blueberry-sauce/) from Koko's Kitchen. [Sourdough Oatmeal Blueberry Pancakes](http://oldfatguy.ca/?p=3397) from **Old Fat Guy**. [Banana Pancakes](https://nutritionkitchenblog.com/2015/07/10/banana-pancakes/) from Nutrition Kitchen. [Almond Cranberry Whole Wheat Pancakes](http://www.breakfastfordinner.net/almond-cranberry-whole-wheat-pancakes/) from **Breakfast for Dinner**. [Pear Pancakes with Grape Sauce](http://thecookiewriter.com/pear-pancakes-with-grape-sauce/) from **The Cookie Writer**. [Apple Pancake Rings](http://www.gettystewart.com/apple-pancake-rings/) from **Getty Stewart**. Thanks to all our members who submitted recipes to today's pancake roundup. Be sure to stop by each day this week as we showcase more pancake and waffle recipes. There'll be over 50 in total - something for everyone!